All smiles during the Pinay in Action Football Fiesta sa Bonifacio High Street. Here’s Sen. Pia Cayetano with some participants seen enjoying themselves a little too much. women’s rights, she believes that sports can be a very powerful tool to empower women. Pinay in Action started with an all women’s run in 2006, and has since grown to include many other sports and fitness events for women, such as all women’s triathlon and running camps for girls. It also recognizes the achievements of inspiring women from all walks of life, through its annual exhibit, “Empowered Filipinas: Raising the Bar”. Under 13, Under 16, and Women’s Open categories. Empowering Girls: One Goal At A Time. the Pinay in Action Football Fiesta sa Bonifacio High Street. 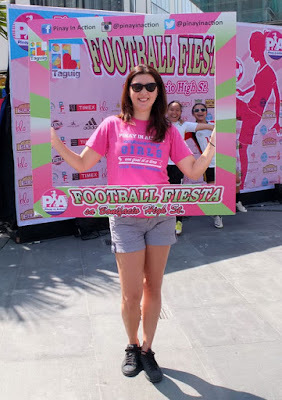 Last weekend (February 13-14, 2016), Pinay in Action (PIA) held the first Pinay In Action Football Fiesta at Bonifacio High Street​​.​ It was a 3-on-3 all-girls tournament led by Senator Pia Cayetano. This was ​just one of the many initiatives planned by Pinay In Action (PIA) to help empower girls through sports​. Pocket activities such as sumo football, anti-gravity yoga, rowing, and cycling classes were free for participants and spectators to try out, too! Participants and spectators got a chance to try out anti-gravity yoga by Beyond Yoga. Saddle Row also held rowing and cycling classes for everyone to try out. Under 13 champion Payatas FC. Under 16 champion Payatas FC. Women’s Open champion Rizal Technological University – A.